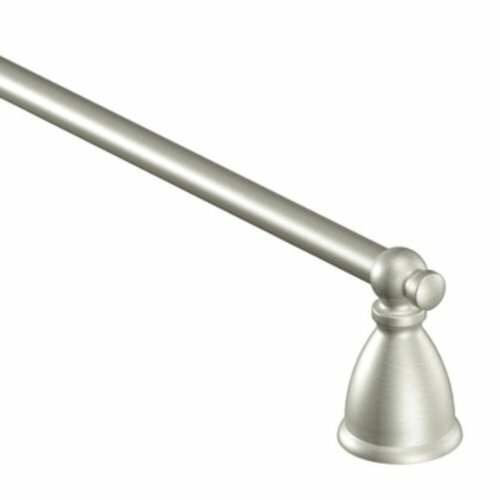 Y3118BN Size: 18", Finish: Brushed Nickel Features: -Tower bar.-Provides a lightly brushed warm grey metallic look.-Product Type: Towel Bar.-Material: Metal.-Style: Modern / Contemporary.-Orientation: Wall Mounted.-Overall Height - Top to Bottom: 2.01.-Overall Length - Side to Side (Size: 18''): 18.-Overall Length - Side to Side (Size: 24''): 24.-Overall Depth - Front to Back: 3.31. Color/Finish: -Finish: 1: Chrome.-Finish: 2: Nickel.-Finish: 3: Bronze. Dimensions: -18 in. : 2.01'' H x 20.01'' W x 3.31'' D.-24 in. : 2.01'' H x 26.01'' W x 3.31'' D.-Overall Product Weight: 1.33 lbs. Collection: -Lindale collection.-Collection: Lindale. Warranty: -Limited lifetime warranty.